captcha doesn't work at the moment - why? We are having problems with the “Captcha field” right now, our developers are working to resolve the bug. We apologize for this inconvenience! After further search, here is a post by one of my colleagues that may work as a temporary solution. As an alternative solution, you may used the "re-Captcha" as it is working fine. 2. 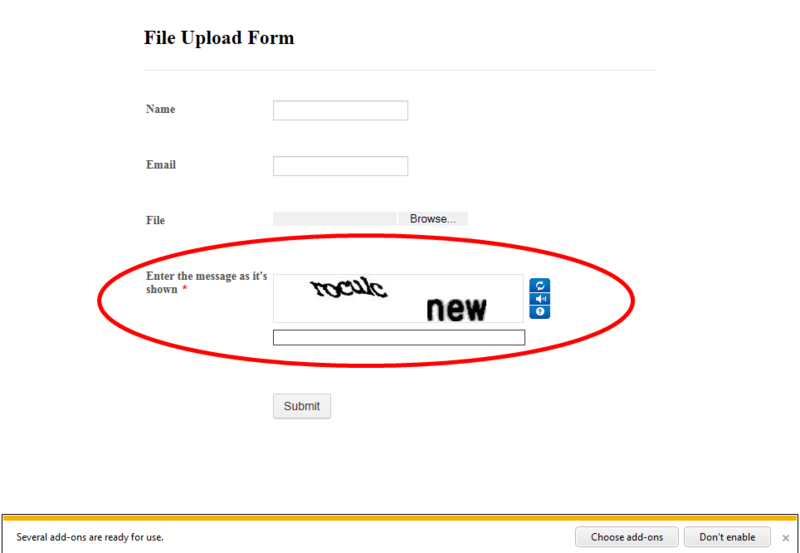 On the Toolbar, choose or click "re-Captha" and it then automatically replaces the captcha field. Sorry to report that re-catcha doesn't work in Internet Explorer. I just tested the re-captcha in IE and it works fine, what version of IE are you using? I'm having the same problems with captcha, so i've tried re-captcha also. It works great in Chrome, Safari and Firefox. But in Internet Explorer 9 it doesn't work!! I too am using Internet Explorer 9 and the re-catcha isn't working. I was finally able to reproduce the error and can confirm that this is related to the captcha problem. Our developers are aware of the problem and are working to solve it as quickly as possible. In the meantime we appreciate your patience until it has been fixed and again we apologize for the problem that this has caused you on your forms. Same thing for me ... not working in Safari and Firefox. Just letting you know. A ticket has been opened and we will inform you as soon as there is a resolution to this issue. Sorry about this. The captcha problem is now fixed.